LOS ANGELES, CA – Consumer Watchdog today joined the Electronic Privacy Information Center (EPIC) and six other consumer groups in calling on the Federal Trade Commission to investigate the misleading and manipulative tactics of Google and Facebook in steering users to “consent” to privacy-invasive default settings. In a letter to the FTC, the eight groups complained that the technology companies deceptively nudge users to choose less privacy-friendly options. The complaint was based on the findings in a report, “Deceived by Design,” published today by the Norwegian Consumer Council. It found that Google and Facebook use pop-up messages to manipulate users into accepting privacy settings that disclose personal information far beyond what is needed to use their services. The Norwegian Consumer Council’s study came as the new General Data Protection Regulation (GDPR) was being implemented across Europe. Leading up to implementation users of digital services were asked to consent to new privacy settings through numerous “pop up” messages. The study found users were deliberately pushed into less privacy friendly options. “Google and Facebook use the same manipulative tactics in the United States and the FTC needs to take a stand against Facebook and Google for deceiving the American people, as well as Europeans, into giving up their privacy,” said John M. Simpson, Privacy and Technology Project Director at Consumer Watchdog. 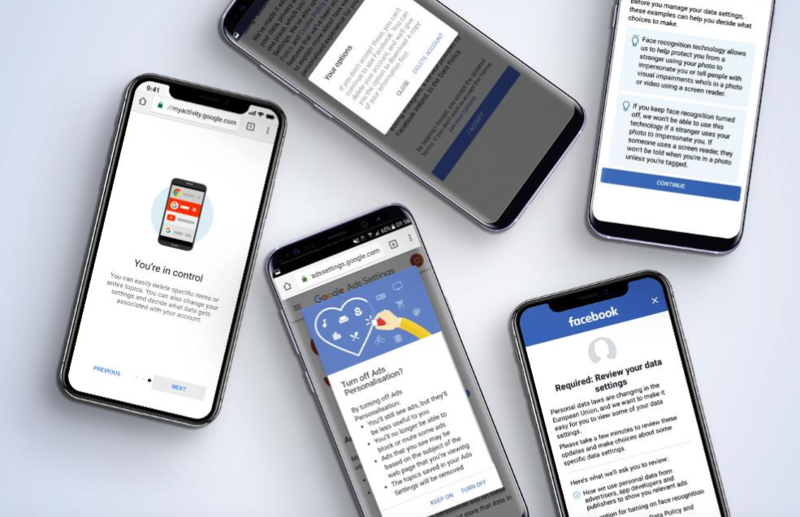 “Companies employ numerous tricks and tactics to nudge consumers toward giving consent to disclosing as much data as possible for as many purposes as possible,” the consumer advocacy groups wrote in the letter to the FTC. Privacy-intrusive default settings: Facebook and Google set the least privacy friendly choice as the default option. This is a problem given that research has shown that users rarely change pre-selected settings. Illusion of choice: Users do not have an option to opt-out of disclosing their data entirely. Disclosure of personal information is a condition for using the service. Yet, Facebook and Google create the illusion of choice by providing “the feeling of control” when the choice is actually very limited. Hiding privacy-friendly choices:Privacy-friendly choices require significantly more clicks to reach and are often hidden away. Deceptive design choices: Disclosure of personal data is presented as beneficial to users, often in combination with threats of lost functionality of services if users decline. “The practices highlighted in this report raise significant issues, including whether these companies are upholding their promises to comply with the GDPR, and whether these tactics constitute unfair and deceptive trade practices under Section 5 of the FTC Act,” the groups wrote in the letter. Joining EPIC and Consumer Watchdog in signing the letter to the FTC were: Campaign for a Commercial-Free Childhood, Center for Digital Democracy, Consumer Action, Consumer Federation of America, U.S. PIRG and Public Citizen.